Making Room for the Oakland A's? Some Jack London Square business owners might be willing to move if the price is right, but others say no. Dan Altwarg of Markus Supply says he might fight an effort to put a stadium where his business is. When Oakland Mayor Ron Dellums unveiled two new ballpark sites for Jack London Square late last year, it rekindled hope that the A's may not leave town after all. But actually building a stadium on either of the new sites may ultimately require the cooperation of property owners whose businesses would have to relocate. During recent interviews, several property owners expressed skepticism that the city will offer them a fair deal to move. Others, though, appear willing to play ball. Merrit Sher, of Metrovation Brokerage, for example, was blunt: "If the price was right, we'd sell," he said. Metrovation owns several properties on the proposed "Jack London North" site, which is west of Broadway in an area bounded by Jefferson and Market streets, and Interstate 880 and Second Street. Sher added, however, that his company has not yet been contacted by the city. "All I've heard is what has been in the papers" he said. Eric Angstadt, deputy director of the city's Community and Economic Development Agency, said that the city has chosen to not contact property owners because it hasn't compiled a comprehensive plan for acquiring the land. The city also is awaiting word from Major League Baseball Commissioner Bud Selig on whether a blue-ribbon panel that studied the Jack London Square sites thinks they are viable. Dellums spokesman Paul Rose said the task force is scheduled to report its findings to Selig next week, although it's not clear when the commissioner will make the results public. "It's purely speculative at this point," Angstadt said. "We're waiting for baseball to give us an answer before we can take the next step." However, even if the next step is favorable for Oakland, it may still turn out to be difficult dealing with some businesses that don't want to move. 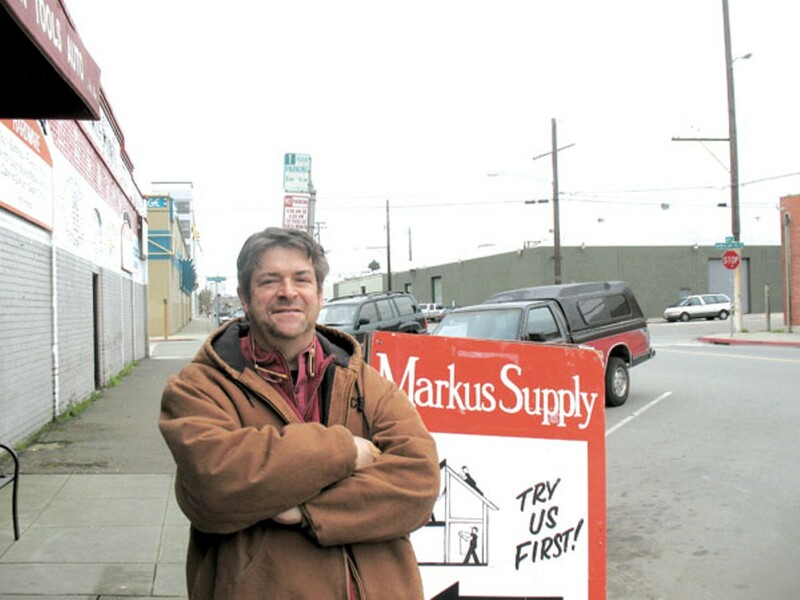 Dan Altwarg, of Markus Supply and Hardware, said he is "devastated" by the idea of being forced to relocate his business, which is also within the "Jack London North" site. Altwarg said, "Of course we'll have to consider their offer." As to whether they would accept it, though, he said he was "not saying no, I'm saying 'I don't know,'" but then added, "I think we're gonna have to fight it." If property owners choose to fight the city's offer to buy their land and pay them to move elsewhere, then the city likely would be forced to use eminent domain, which can sometimes result in drawn-out, ugly legal battles. Dellums has said that the city would use redevelopment funds — and not the city's general fund — to buy land for the ballpark and pay for business relocations. For the record, the owners of the Express, which leases office space from Metrovation, are open to relocating, even though the paper just moved to Jack London Square in May of last year. "We support a downtown-area ballpark for the Oakland A's, and assuming that we and our landlord would be properly compensated, we would be happy to move," said Express co-owner Stephen Buel. The announcement of the new Jack London Square sites was prompted by attempts by team co-owner Lew Wolff to move the A's to San Jose. Wolff also previously had tried to move the team to Fremont, but his plans ran up against vocal opposition from the local community. However, Fremont city leaders recently unveiled a proposal to build a new ballpark at the old NUMMI auto plant, which is scheduled for closure soon. As for Wolff's plans to move to San Jose, they must overcome the San Francisco Giants' territorial claims to the South Bay. The other new Jack London Square site is known as "Victory Court," at the Lake Merritt Channel, east of Oak Street and south of I-880. Jonathan Breznikar of East Bay Restaurant Supply, which occupies land within the proposed ballpark location, said that he "wants the A's to stay" and is "all about Oakland" but also noted that "it's difficult to uproot a wholesale business." Peerless Coffee and Tea is another business on the Victory Court site, and the one that may be most impacted if forced to move. "We've got a building full of packaging and roasting equipment specifically designed for this facility. So it would be very expensive for the city to pay to move us," said George Vukasin Jr., co-owner with his father of the third-generation business. Vukasin Sr. is no stranger to sports teams. He served for years as president of the Oakland-Alameda County Coliseum board and has been a major proponent of keeping Oakland's teams in town. But when it's their own property being considered for redevelopment, even longtime team backers may drive a hard bargain. When asked whether they would be open to a proposal from the city, Vukasin Jr. said: "It's a tough question. It all depends what they're proposing." He quoted an estimate of about $30 million, which he based on the cost to Peet's Coffee to build their new roasting plant in Alameda. Vukasin Jr. said that Peerless and Peet's have similarly sized operations. He noted that he and his family are "huge fans of the A's, and huge fans of keeping them in Oakland," but he also predicted that if the city were to attempt to go to court and confiscate property by purchasing it through eminent domain, there would be a backlash. "I think people would come out of the woodwork," he said. Burnt Ramen Punk House Residents Thought City of Richmond Would Help. Instead, They Got Evicted. Tenants Still Fighting Red-Tagging of the Nearly 20-Year-Old Underground Music Institution.